Hand written and signed letter “J. A. Garfield,” one page, 7.75 x 10.5, May 19, 1871. 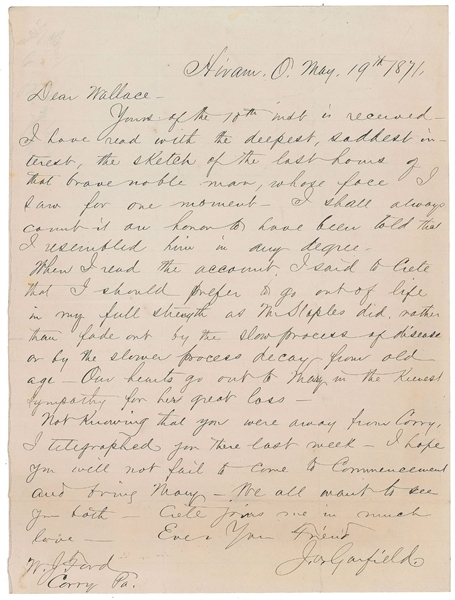 Letter to Wallace J. Ford in Corry, Pennsylvania, in part: "I have read with the deepest, saddest interest, the sketch of the last hours of that brave noble man, whose face I saw for one moment. I shall always count it an honor to have been told that I resembled him in any degree. When I read the account, I said to Crete that I should prefer to go out of life in my full strength as Mr. Staples did, rather than fade out by the slow process of disease or by the slower process decay from old age. Our hearts go out to Mary in the keenest sympathy for her great loss. Not knowing that you were away from Corry, I telegraphed you there last week. I hope you will not fail to come to Commencement and bring Mary. We all want to see you both. Crete joins me in much love." 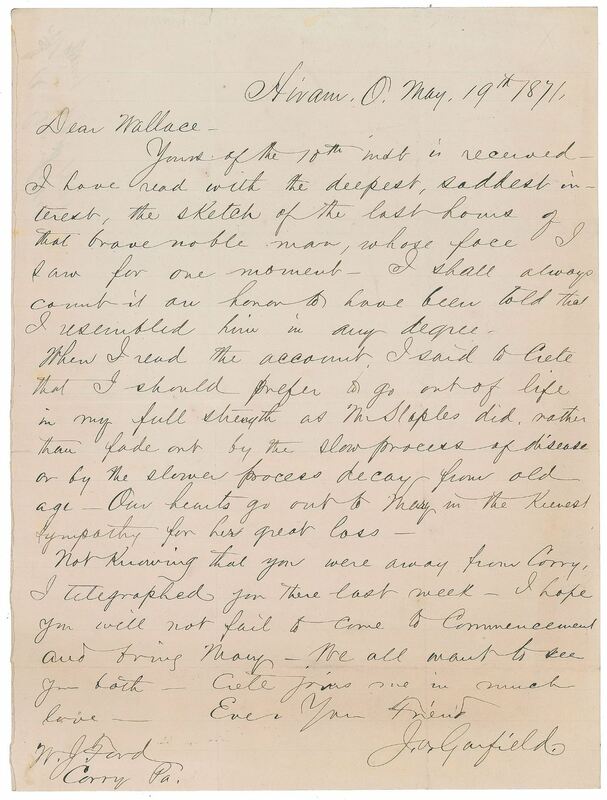 Garfield was serving in the House of Representatives as a congressman from Ohio at the time he penned this letter. He makes several informal references to his beloved wife Lucretia—"Crete"—and remarks on the unappealing prospect of decay in old age. After assuming the presidency ten years later, Garfield was struck down by an assassin's bullet on July 2, 1881.